The main focus of my photography is bird, flower and wildlife. I barely pay much attention to bugs. But if you love bugs, really, Georgia is a heaven for bugs! We have a very short winter and a long, hot summer. I start seeing flies in March and before the summer break, you will see fire flies swarm all over the place. After observing their interesting behavior, I quickly snapped few shots and the most importantly, recorded what I just saw. I had no idea what they were at that time ... just knew they are smaller than a piece of rice. After checking with my ID book, I found out they are Scarlet-and-Green Leafhoppers ( Graphocephala coccinea). They are native to the Eastern areas of the U.S. and adjacent areas of Canada. They have bright color of blue/red or green/red colors. The most striking discovery for me is to know that they inject saliva into plants while sucking juice out of plants for food, which blocks tubes for the transportation of sap, often causing plants to wither and drop leaves!! 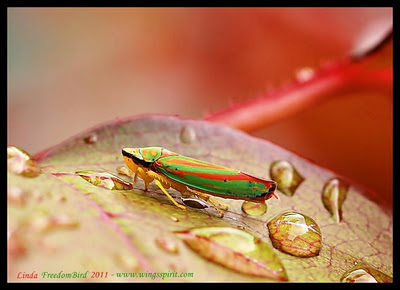 I am sure leafhoppers (and millions of other insects) exist on earth way before human does. I was fascinated to know that tiny creatures like Scarlet-and-green Leafhoppers have such a huge impact to plants.